Yesterday, I took my 4.75-year-old niece to our local public library for some free entertainment. It got us out of the “sit on the couch and watch a princess film” rut, sparking imaginative play for her and creative inspiration for me. My local library features lots of fun activities for kids. From a wide array of Easy Fiction and Early Reader book selections to pre-school computer games and even a tablet for the technologically advanced child. 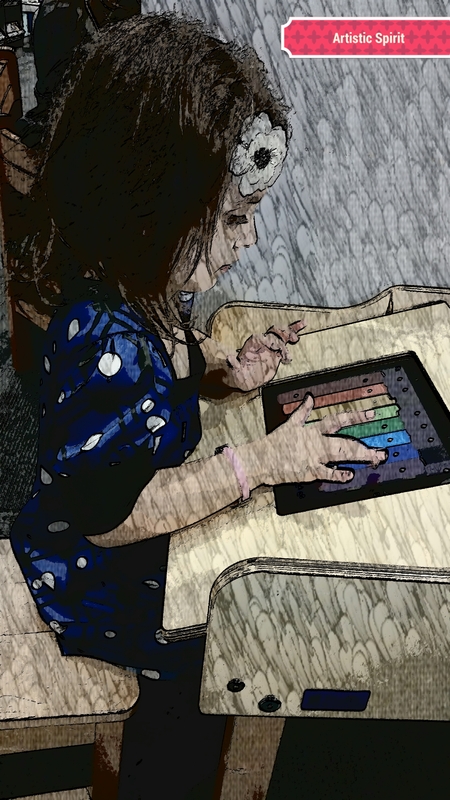 Though she started with music and coloring apps on the tablet, she quickly moved to an actual color-with-crayons station. She seemed to enjoy the latter more than the prior, as she could take her time and even pick out cool stickers for her creation. While adults can sometimes be rather closed off in making new friends, I noticed how easily kids recognize kindred spirits. My niece quickly befriended another almost five-year-old girl and they spent the next 30-45 minutes playing together. They laughed, followed each other from spot to spot, played with the hand puppets, and gave hugs when it was time to leave. I gave her space to play while keeping her in clear sight at all times; I was inspired to watch two children who knew only one another’s name play with such joy and excitement. We could learn so much from young ones who recognize the similarities among us instead of the superficial differences. I’ll bring her back there again next week, not only for the educational exercises but for the social interaction. Though I chose the library to help stimulate an already blossoming love of reading, I ended up learning more from watching her than I ever anticipated.